This newest addition to Essencore's exclusive KLEVV range of professional gaming memory modules is the CRAS X RGB DDR4. KLEVV CRAS X RGB memory combines awe-inspiring fluid multicolor RGB lighting effects with top notch gaming performance, stability, and compatibility. KLEVV CRAS X RGB is available in 8Gx2 and 16Gx2 configurations. It offers support for compelling speeds of 3466 Mhz as well as 3200 Mhz. It is compatible with the latest powerful Intel® processors. 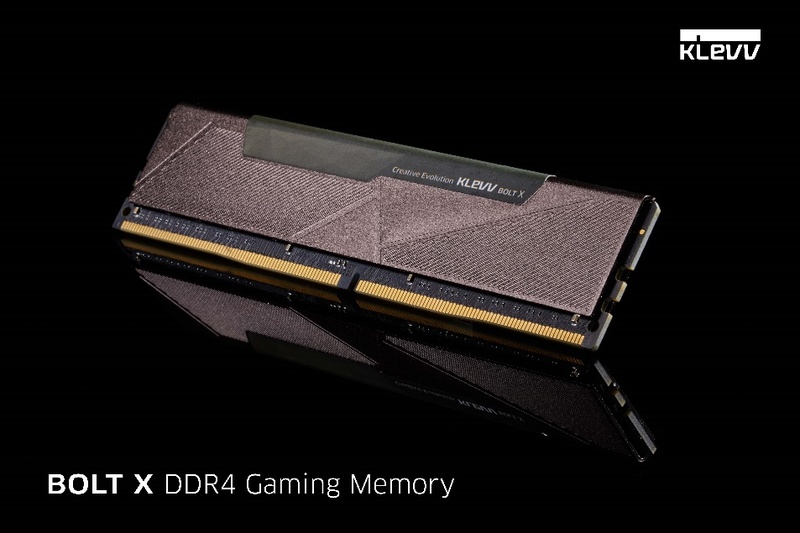 Essencore simultaneously announces the stylish, classy KLEVV BOLT X DDR4 Gaming Memory. This memory module is available in 4G, 8G or 16G configurations. It has support for speeds of 3200 Mhz and 2666 Mhz. Understanding that every users’ gaming experience can be unique and personal, KLEVV CRAS X RGB lighting effects are fully configurable and controllable by the user, allowing owners to create eye-catching, dazzling, or subtle background effects. KLEVV CRAS X RGB supports ASUS Aura Sync, Gigabyte RGB Fusion, MSI Mystic Light, as well as ASRock Polychrome RGB synchronization and management software, allowing users to illuminate their gaming PCs with stunning eye candy, such as mesmerizing RGB waves flowing across the array of memory modules. Both the KLEVV CRAS X RGB and BOLT X have undergone Essencore's rigorous test procedures to ensure the highest quality and reliability. These DDR4 modules further feature reduced voltage and ultra-low power consumption while still maintaining unbeatable stability. These new modules are QVL (Qualified Vendor List) approved. They are compatible with leading mainstream motherboards, as well as the latest Intel® CPUs, and also support Intel® XMP (Extreme Memory Profile) 2.0 technology for easy one-click overclocking.